If you don’t have a cockerel or would like to breed a variety of chicken that you don’t already keep, then buying a fertilised egg is your only option. There are a large number of chicken breeders and a wide variety of chicken breeds to choose from. To help you choose what breed of chicken would suit you take a few minutes to read our Chicken Breed Guide. 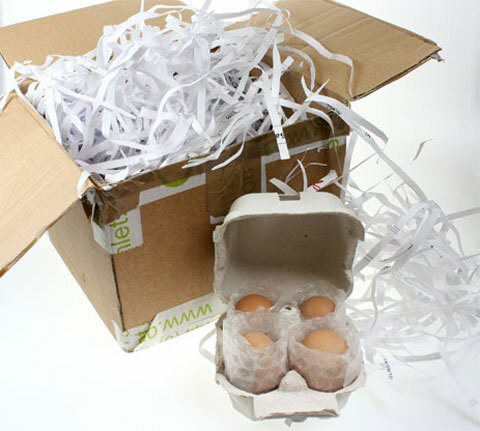 How eggs arrive packaged in the post. To help you find a local breeder - we have prepared a recommended breeder list which you can view here. If you can't find the breed of chicken you want then it is worth looking in your local paper, ebay, craigslist or buying a copy of a popular poultry magazine. When buying hatching eggs it is important to buy from a breeder with a good reputation. It is also worth purchasing eggs from a breeder local to you as shipping eggs can reduce the chances that the eggs will hatch. How much should you pay for a fertilised egg? The price of a fertilised egg varies from breed to breed. The most expensive eggs tend to be for rare breeds and breeds that lay only a few eggs. The price of eggs is normally between £0.80 - £2.00 per egg. Most breeders will sell you a half dozen eggs. good day... would it be possible to order fertile chicken eggs? I would like to have 3x female and 1x male chicken for me to hatch them. How much it cost to order them 4x eggs from you? Awaits to hear from you. thanks!